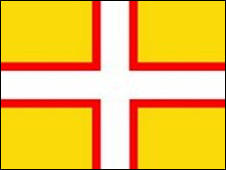 The gold in the Dorset Cross said to represent the 'sunny' people of Dorset. Dorset's first ever official flag has been chosen after a poll attracting thousands of votes. The Dorset Cross attracted 54% of the 3,868 votes cast in a competition organised by Dorset County Council. 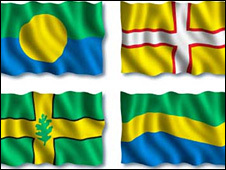 Four designs were shortlisted for the county, which was the only one in the south west without a flag. Previous attempts to choose a flag for the county lacked support, but it grew with the 2012 Olympics sailing events being held in Weymouth and Portland. Dorset Cross campaigner Dave White, from Dorchester, said: "We're very pleased about the result - we're glad that when it went to a vote, what we believed has been proven." Co-designer Chris Brown explained that the gold colour was taken from the Gold Hill and Gold Cap locations in the county. He added: "The county council coat of arms is predominantly gold and red and there's lots of other gold references but the one I really like is that it represents the golden and sunny disposition of the folk in Dorset." The four final designs were shortlisted by an independent judging panel from 29 submitted by Dorset people. Graham Bartram, the chief vexillologist, someone who studies flags, at the Flag Institute and chairman of the judging panel, said: "Many counties are adopting their own flag to show pride in their area. "Dorset has taken a very democratic approach in inviting people across the county to vote." John Peake, chairman of Dorset County Council, added: "It's wonderful that so many people have voted and that we now have a symbol for the county we all love."